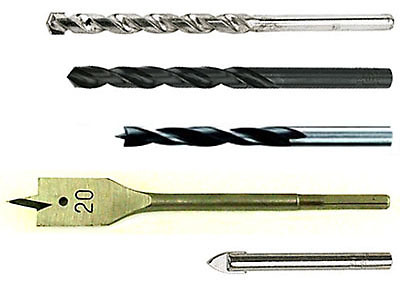 You'll need to choose the right type of drill bit for different types of materials you're drilling into. Take a look at some of the main options. Wood bit with brad point also for wood but notice the fine point which makes it much easier to drill exactly where you want and also avoid the drill slipping. Can also be used in plasterboard walls.